It’s good to be able to offer your readers the choice between the paperback format of your book and an electronic version that they can access easily when they are on the move. Multiple eBook formats can be made available for sale on CompletelyNovel. We provide the option for you to upload and sell PDF and ePub versions of your book, which can be read on devices such as Kindle, iPad and Kobo – among many others! When you create a book on CompletelyNovel, you will see the option to create an eBook or a Print-On-Demand paperback on the first screen. Selecting ‘eBook’ will take you to the eBook creator, which is much the same as the paperback Book Creator, as you will see below. If you have a paperback version of the same book (and we always recommend you do for the reasons outlined in our article on The Writing Platform), you can add it to the same ‘Listing Group’ by choosing it from the dropdown menu at the top. 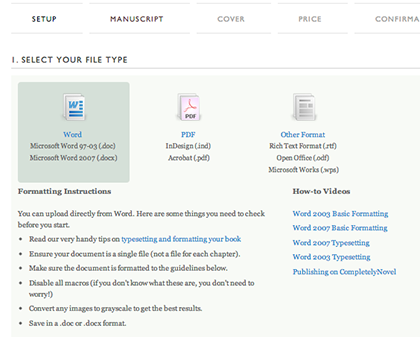 When it comes to preparing your manuscript for conversion to one of the eBook formats, we have put together lots of hints and tips over on our eBook Publishing advice page. So, if you’re at the preparation stage, do head over and have a look. We also offer some advice within our Book Creator tool in case you need some extra tips. You can upload both a PDF and ePub version of your book within the same Book Creator process, so your customers can benefit from both. When you have finished uploading your manuscript, you can then upload a cover image and set your price for your book. What is the average sale price for your genre? What is your goal for sales? If you are looking for exposure or larger sales volumes, it may be better to set a lower price. If your book is essential for your audience, you may be able to charge more. The minimum price that you can set on CompletelyNovel is £1.99, and we take a 20% commission of all eBook sales through the website. CompletelyNovel does not offer distribution of eBooks through external retail channels – if there is a specific channel you wish to put your book in such as Amazon Kindle, we recommend using their services directly or going through another eBook aggregator. We’ve got more advice on using these platforms over on our eBook Publishing page. 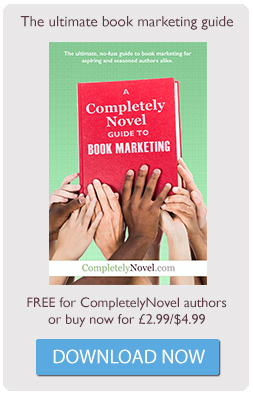 Customers can purchase eBooks by going to the book’s dedicated page on CompletelyNovel and clicking on the ‘buy’ link. We will provide them with a link to the eBook files, which they can download. If you have provided both ePub and PDF files, they will be able to download both, and will also receive an email with the link, should they need it again in future. The royalty will be added to your CompletelyNovel account along with your other royalties from any print book you have published. You can track these on the Sales section of your portfolio.